Hello, lovelies! It's been almost a week ago had passed but I still can't get over from our stay at ARUGA by Rockwell Hotel. We truly had an amazing stay there. I'm planning to blog about our stay but I'm not so sure when it will be up in case I decided to. I hope my schedule clears by next week so that I will have time to do so. The airconditioners worked great; it's so damn cool. 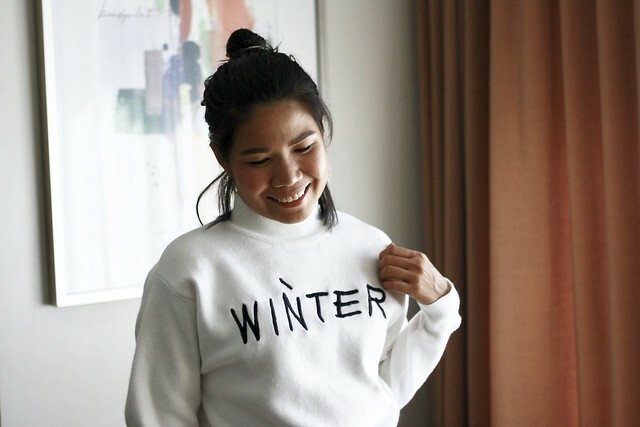 Good thing I bring this winter graphic high neck sweater with me during our stay; it kept me warm all the time. What I love most about this sweater from ZAFUL is its material. The graphic WINTER literally says the sweater is really for winter. Its thick yet soft and not heavy. It comes in one-size and I really love the fit on me; not loose either. Here in my country, this is not advisable to wear as your normal shirt because of its thick material. This is perfect to wear when you're in Baguio City or if you're here in the metropolis, be sure to wear it in a very cold temperature or in an airconditioned room or else you'll end up showering sweat.